How do I transfer music files from mobile device to Gear S3? To import images form your mobile device to Gear S3, On the Apps screen of the mobile device, tap Samsung Gear. ,then select the tracks you wish to send (2-2) and tap DONE (2-3). When the Gear does not have enough available memory, it deletes files that you have not set as your favorites in order from oldest to newest. 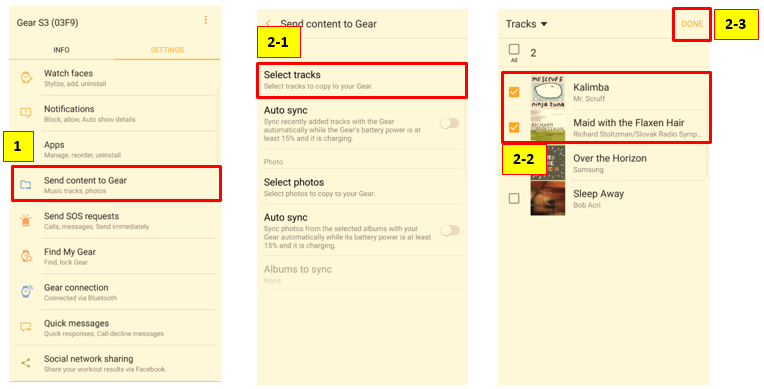 To sync the music in the mobile device with the Gear, tap the Auto sync switch (3). The selected files will be synced when the Gear is charging. 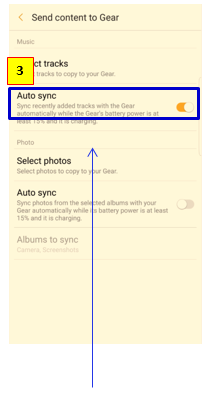 Note: To sync music in your mobile device with your Gear, tap the Auto sync switch under Music. it has more than 15 % of remaining battery power. Samsung Pay: How to use Samsung pay application on my Gear S3? [Gear S3] Why the alarm has no sound even it was set already?